One of my favourite foods in the whole world is the humble sandwich. I often take sandwiches to work for lunch but I am not a fan of ‘boring’ sandwiches – cheese, cheese and ham, pickle, egg mayo etc…I like to make my sandwiches worth my while and they tend to be really quite special. If I take a boring sandwich to work I am often so uninspired by it by the time 1pm rolls around that I naughtily buy soup or crisps to accompany it, thus negating the whole point of bringing my own healthy lunch and saving money. So, I spruce my sandwiches up and spend the whole morning eagerly anticipating the moment the clock reads 13.00 and I can fling open the fridge and devour my lovingly prepared meal. In my Hello Kitty bento box too of course. Wrapped in foil, not clingfilm, I have a funny thing about clingfilm. It just doesn’t look as nice. One of my all-time top sandwich fillings is one that only presents itself to me a few times a year. When I look in the fridge and realise I have all the components available, the angels are surely smiling down at me. It is of course, the Leftovers Sandwich. Yep, it needs capitals. This particular sammie is rarely found during the spring and summer months, preferring really to lay low until the winter creeps in, the 25th of December to be exact. If you’re lucky you may stumble across this sandwich in it’s wild and unorganised form following a Sunday roast which was rather overcatered for. This particular sandwich presented itself to me one day in late November when I was, very unusually for me, off work with a headache and cold. As I stared into the depths of the fridge, willing a lunch to form, I spotted the key components of cold turkey, brie and cranberry sauce. Almost daring not to breathe, I glanced over to the counter silently praying…yep, tiger bread. Lets do this. First things first, we needed some carbs up in this sammie. What do you mean bread is a carb? Get out. Although we had no leftover roasties (extremely rare in my household) we did have a few new potatoes in the fridge, which to be honest looked to be on the way out so I turned the oven on and got to work slicing. Slug of olive oil, salt and pepper, they went in the oven for about 20 minutes. I sliced the bread, big old thick slices, go hard or go home. Into the toaster it goes. 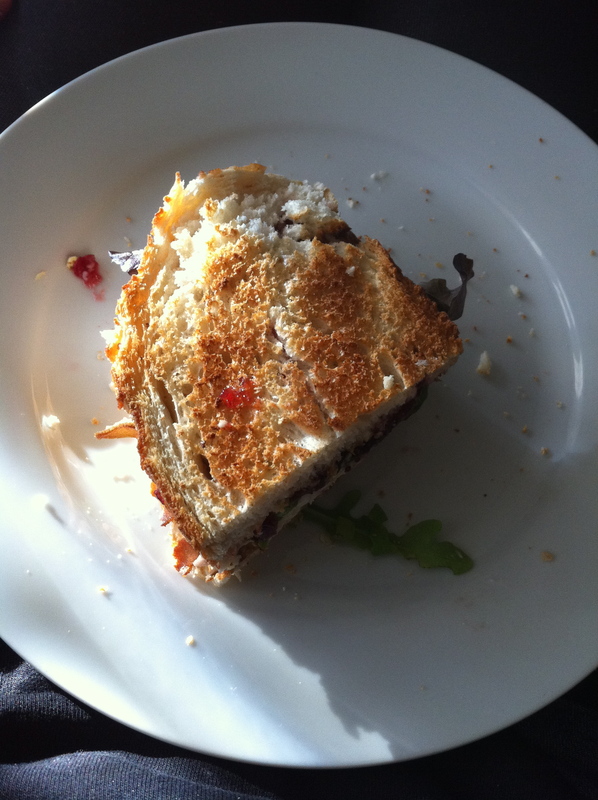 Once toasted, I spread the bread with cranberry sauce and layered on a couple of slices of lovely creamy brie. Brie + cranberry sauce = The Christmas Dream. 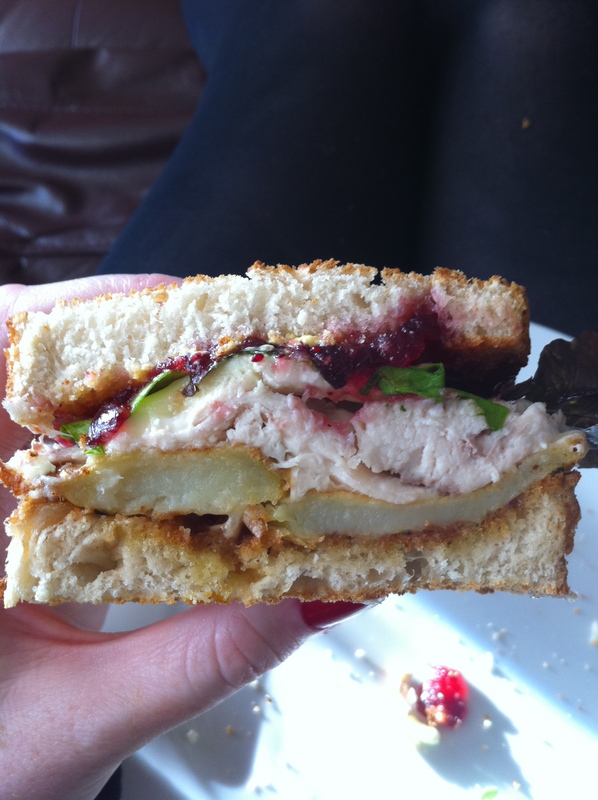 I then placed a couple of slices of turkey on the bottom slice of bread and waited very impatiently for my potatoes to be done. After what felt like DAYS they were perfect, crispy on the outside and fluffy on the inside. I had of course cooked enough for a family of four so I saved half for a leftover-leftovers sandwich the next day, bonus! I layed the potatoes on the turkey and topped the whole thing with some lovely leaves for a bit of greenery and texture. The top slice of bread was placed carefully on top and I then pressed down on the sandwich slightly to try and encourage some kind of stickage to make for easy lifting. A swift slice down the middle and the Leftovers Sandwich was complete. I very bravely ate the entire thing but felt very ill afterwards and had to lie down for an hour before I felt recovered enough to tackle the washing up. Very big lunch and I must stress this is not normally what I take for a Tuesday at work! I was off sick and Leftover Sandwiches are incredibly healing. I strongly recommend trying this sammie, really got me in the mood for Christmas!